Rudolf Metz was born on 27 October 1921 at Hameln. In October 1940, he entered the Luftwaffe and was trained as a fighter pilot at Jagdfliegerschule 3, based at Stolp-Reitz, and Ergänzungs-Jagdgruppe West, based in southern France. 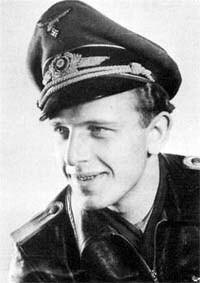 In February 1943, Metz joined JG 5. He was initially assigned to 1./JG 5, based at Stavanger in Norway, but was later transfered to 12./JG 5, based at Bodö. On 7 November, his aircraft was damaged by 40mm Flak when he attacked a British Schnellboot but he was able to return to the base safely. Metz was awarded the Eiserne Kreuz 2. Klasse on 18 November. Metz joined Sturmstaffel 1, performing Reichsverteidigung duties based at Salzwedel in Germany, on 23 March 1944. The unit was equipped with heavily armed and armoured single-engine fighters for combatting the increasing Allied four-engine bombers raiding German-occupied Europe. At this time Metz had at least one victory to his credit, achieved in about 60 combat missions. On 11 April, he shot down a USAAF B-24 four-engine bomber over Haldersleben to record his second victory. On 8 May, Sturmstaffel 1 was redesignated 11./JG 3 under command of Leutnant Werner Gerth (27 victories, RK, KIA on 2 November 1944). On 12 May, Metz claimed three USAAF B-17 four-engine bomber Herausschüssen in nine minutes (3-5). On 30 July 1944, Metz was transferred to JG 4. Leutnant Metz was assigned to 8. (Sturm)/JG 4 based at Welzow. On 27 September, he shot down two B-24 in one minute southeast of Kassel, to record his 8th and 9th victories. Metz recorded his 10th victory on 6 October 1944, when he shot down a B-17 near Rathenow. However, he was then shot down and killed in his Fw 190 A. He was posthumously awarded the Ehrenpokal on 11 November 1944. Rudolf Metz was credited with 10 victories. He recorded one victory over the Eastern front. All his victories recorded over the Western front were four-engine bombers.